The Running Professor: What did we learn from the first 2 weekends of Cross Country Races for the top Division 1 Universities in Indiana? What did we learn from the first 2 weekends of Cross Country Races for the top Division 1 Universities in Indiana? When I ran my college cross country in the 1960's the world was much simpler. You had a bunch of dual and tri meets scheduled with other universities that you wanted to defeat.The big meets at the end of the season were just meets with lots of teams; they were not more important than regular season victories over arch rivals. If the coach was confident of an easy victory during the season, he (and there were only 'he's' in those 'bad old days') would schedule a fairly normal training session the day before and instruct the runners to treat the race as a workout day. Otherwise the team took it easy the day before a meet and ran hard to win the race if possible and otherwise to do as well as possible. Coaches did not rest runners to save them for later in the season. Now the terrain for university cross country appears to be more complex. Most regular season cross country meets involve several teams, sometimes lots of teams, but the early meets especially are like exhibition meets for the most part although some do convey bragging rights. The races that really matter are the ones at the end of the season, the conference championships and then the series of NCAA races from regionals up to the national championship (for the lucky few teams that get that far). 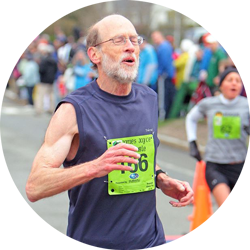 Because of that and because runners typically train much harder than we did in my day [I cannot remember any 90 mile weeks in the 1960's], coaches are constantly figuring out which runners to enter in a race and which to rest. Sometimes coaches will split teams up to run certain runners in one meet and others in a different meet depending on which makes sense for the individual runner's development that season. The top runners may only run 3 to 5 times before the big meets toward the end of the season. With this background in mind we perhaps do not expect to learn too much from early meets on the first two weekends. Only four of the six Indiana universities were active in the first weekend of the season, Saturday, August 29th. Butler hosted its 'Butler Opener', a new meet, at the Northview Cross Country course in Carmel, IN. My guess is that it was scheduled in part to give the runners some familiarity with the course and the basic layout there; Butler will host the Big East Championship there at the end of October. Those races, men's and women's will be over 8K and 6K respectively whereas last Saturday's events were 6K and 5K respectively. The other teams were IUPUI and Marian University [NAIA], an up and coming team in their association. We did not learn much from the men's race because both the Butler and IUPUI coaches held their top runners out and used it as a time trial/test for their depth runners and new recruits. And, of course, as a 6K, it is only 3/4ths as long as the typical early to mid-season race [8K]. What we learned is that Butler's depth is better than IUPUI's at least for the first two runners and at this shorter distance. Butler had the first two runners in although it was competitive after that and IUPUI got 7 runners in before Butler's 5th runner. So we do not learn anything to suggest the form book is wrong. What about the women? IUPUI actually defeated Butler but the story is more complicated because Butler held their first three runners (at least) out of the race while IUPUI held out only one of their top three. Even without those, the Butler women took first and second in the race. After that, the IUPUI depth took over. So what initially looks like a shocker is probably not. No reason at this point to think Butler would not dominate if they and IUPUI both run full strength. We should have a better idea after the Indiana Intercollegiates on the 19th of September. For Indiana State it was a similar story in that they traveled to Carbondale, IL to take on the Southern Illinois Salukis in the Saluki Early Bird run. Southern Illinois is apparently the favorite to take the Missouri Conference title but they kept their top runners out of both the men's and women's races. ISU also kept some runners out and they ran a 4K course. So it was really more of a training workout than a real meet. The only other top 6 team in action was Purdue who traveled to Nashville, TN to run in the Belmont Opener. The good news for the Purdue men is that they were able to run as a pretty tight pack in this early season 5K race. Unlike Butler and IUPUI, it appears that all of the top Boilermaker runners were in action. Matt McClintock led the way with a third place finish in 15:11 and another four Boilermakers finished within the next 17 seconds. Purdue won the meet although Middle Tennessee State's top four were formidable, taking 3 of the top 4 spots and their fourth runner coming in before the second Purdue runner...but they had no comparable 5th runner. So good news for the Purdue men's team at this stage. If they can keep a tight pack as they move up in distance over the season, they will be much more formidable than last year. The Purdue women brought home a 4th place finish of 12 D1 teams. The good news for the Boilermaker's women's team is that Kiara McIntosh was able to run up with the two I had pegged as Purdue's leaders, Laura Maibuecher and Michelle Potter; they finished 17th, 18th, and 19th respectively. They finished within six seconds of each other but then there was a gap of 20 seconds before their 4th runner crossed the line. So they were not as tight as the Purdue men were. Still having a top 3 rather than a top 2 will be useful for the Boilermakers if that continues over the course of the season. So we learned a little bit about Purdue and hardly anything new about Butler and IUPUI. We are left to wonder how the season will progress. Typically each year there are runners who unexpectedly move up and make big contributions. And there are disappointments and injuries and strategic decisions to make a year a red shirt year. We will learn of those things as the season unfolds. It should be exciting. September 6th. Although they ran regular season distances of 8K (men) and 5K (women), it was not a tight contest as IU took the top 7 spots in both men's and women's races against Tennessee Tech. And Notre Dame and IUPUI met yesterday, September 5th, along with Valparaiso, at the Crusader Open in Valparaiso, IN., also running 4K's (in part because of 90 degree weather) Notre Dame ran sophomores and freshmen only in the men's contest and won the meet 24 to 32. Valparaiso finished far back with their first runner coming in after both Notre Dame and IUPUI's top 7. 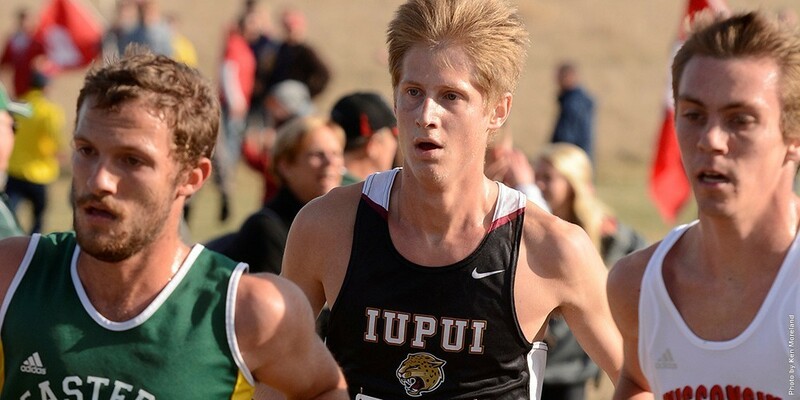 IUPUI's Joey Zielinski, pictured in 2013, is back in top form. 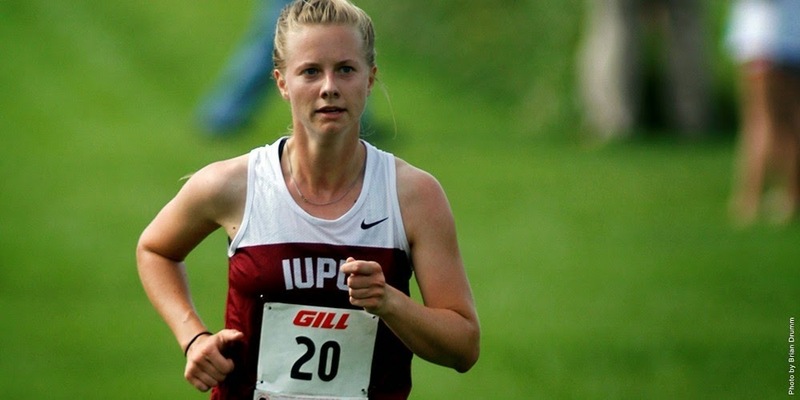 IUPUI ran a strong contingent of runners and it was a good early test. Joey Zielinski and new Xavier transfer, Tom Ohlman, were at the top of the list for the Jags, showing that Zielinski has fully recovered from the injury that kept him off the track last spring. There was nothing in these results to suggest that the Jaguars are ready to test the Irish when they are at full strength, however. Notre Dame ran only 3 runners on the women's side so it was mostly a contest between Western Michigan and IUPUI. The Jaguars came close, led by Leah Brooks and Savannah Turner, but the Broncos of Western Michigan edged them by 4 points. So as with the meets on the 29th, good early action but we do not learn very much new. So there's a lot of mystery to the season still and I am eager to see it unfold. The next major action is the Indiana Intercollegiates at Purdue on Friday, September 19th. Five of the top 6 top teams will be there; Notre Dame hosts the National Catholic Championships on the 19th so we won't get a first full head-to-head look, but almost.